In 1598, the first English convent was established in Brussels and was to be followed by a further 21 enclosed convents across Flanders and France with more than 4,000 women entering them over a 200-year period. In theory they were cut off from the outside world; however, in practice the nuns were not isolated and their contacts and networks spread widely, and their communal culture was sophisticated. Not only were the nuns influenced by continental intellectual culture but they in turn contributed to a developing English Catholic identity moulded by their experience in exile. During this time, these nuns and the Mary Ward sisters found outlets for female expression often unavailable to their secular counterparts, until the French Revolution and its associated violence forced the convents back to England. 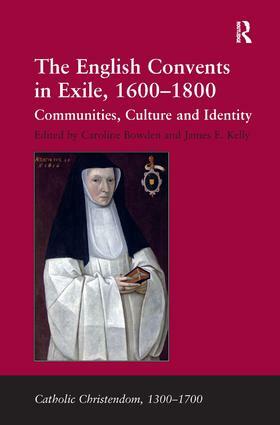 This interdisciplinary collection demonstrates the cultural importance of the English convents in exile from 1600 to 1800 and is the first collection to focus solely on the English convents. Caroline Bowden is Research Fellow and former Project Manager of the ’Who were the Nuns?’ project funded by the AHRC at Queen Mary, University of London, and has published a number of papers on women’s education and learning and the English convents in exile. James E. Kelly is post-doctoral fellow at Durham University’s Centre for Catholic Studies, Project Manager of the ’Nuns’ project at Queen Mary’s and researches post-Reformation Catholic history in Europe and Britain.